Previously, Fault Tolerance was a unused feature due to the fact that until vSphere 6, FT only supported a single virtual CPU. Most modern applications require more than one CPU. Frequently, people were disappointed when they tried to use FT on vCenter only to find that vCenter required a minimum of two vCPUs. Thus, they were unable to use FT. This caused FT to be a unique use case and rarely used due to its limitations in terms of meager resource maximums. 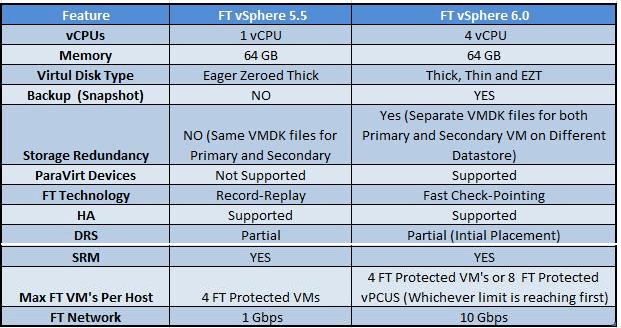 With vSphere 6, this has all changed; FT VM now Supports upto 4 vCPUs and 64 GB of RAM (Which was 1 vCPu and 64 GB RAM in vSphere 5.5) The additional vCPU capacity means that you can achieve cluster-like uptime without the complexity and expense of clustering software and the associated management. FT has been renamed “SMP-FT” to reflect the fact that it is now multi vCPU. In real terms, this opens up a whole new world of possibilities to use FT in the real business world. It is also extremely easy to use compared to classic clustering. VMware Real Time Scenario 4vSphere Client 6.0 (C# version) can’t connect to vCenter server?? ?